When a series of devastating wildfires ravaged California, thousands of homes were lost in minutes and many people were suddenly coping with unprecedented challenges. In small towns with a big sense of community, neighbors came together to help one another, mobilizing with great generosity. Weeks later, many community groups and agencies big and small are still working together on the relief efforts—distributing truckloads of relief supplies, while also providing food, comfort and shelter to those affected by these disasters. In the initial hours of the California Wildfires, working closely with local emergency management, several community groups and the American Red Cross opened a combined total of 12 shelters across California for those impacted by the many wildfires. Amador and Calaveras Animal Services as well as other animal groups have provided care for the evacuated pets and animals. The shelters have satisfied the immediate needs to evacuated residents, including a safe place to stay, food (meals, snacks), water, medicines and basic health services, emotional support and other support resources. To date, community groups and Red Cross have supported over 11,000 overnight stays for residents affected by the evacuation orders. The Southern Baptist Convention, Salvation Army, and Jackson Rancheria were among some of the partners that cooked up delicious meals for families and individuals that were at the shelter and also received a hot meal from one of our emergency response vehicles…. Together we were able to serve more than 85,000 meals and snacks. The difficult recovery from these wildfires makes this a frustrating and emotionally draining time for everyone involved. Calaveras County and Red Cross Mental Health and Health professionals have provided over 8,500 basic health and mental health connections. Clean clothes were also scarce in the smoky aftermath of the fires and communities were without access to water or power. As dirty laundry piles grew larger, the Southern Baptist Convention brought in the laundry trailers to provide free laundry services as well as shower trailers. Several churches and community groups in Amador and Calaveras Counties, Home Depot, Lowe’s, Ace Hardware as well as the Red Cross, have been gathering and handing out cleaning, hygiene and comfort items in hardest-hit neighborhoods devastated by the Butte fire. These items include water, snacks, non-perishable meals, and clean-up items such as gloves, buckets, trash bags, sifters, and dust masks. To date, over 50,000 relief items have been handed out. Assistance Centers have been opened where residents can access resources available from many organizations, including Children’s Disaster Services, Salvation Army, Team Rubicon, government departments like EDD, Cal OES, DMV, and corporations like PG&E and AT&T. There, Red Cross case workers are meeting one-on-one with people on matters such as family reunification, funeral assistance, emergency needs and recovery planning. 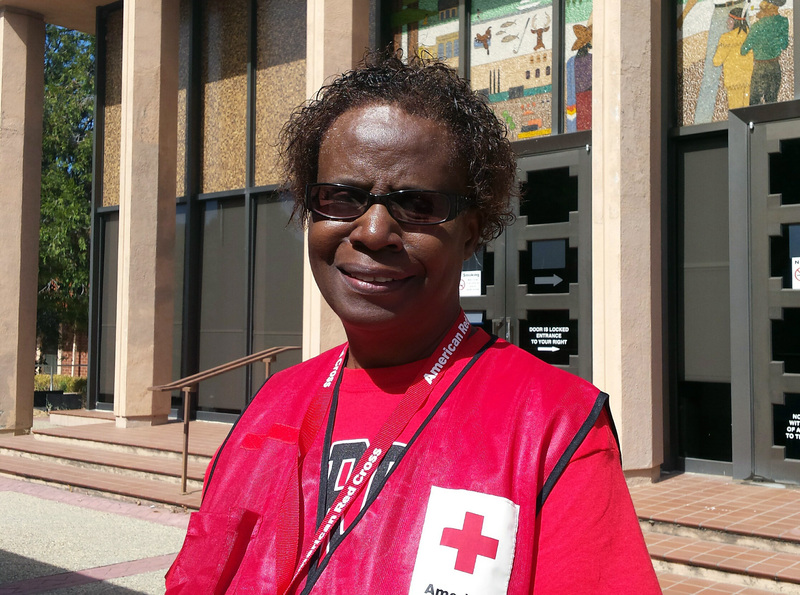 If the Red Cross is not providing for a specific need, our caseworkers are able to help residents get connected with a partner agency that is meeting that specific need. Nearly 1,200 cases have opened by Red Cross caseworkers to provide individualized recovery support. Disasters are often complex, with multifaceted needs – and no single agency can meet every need on its own; it takes collaboration and partnership. 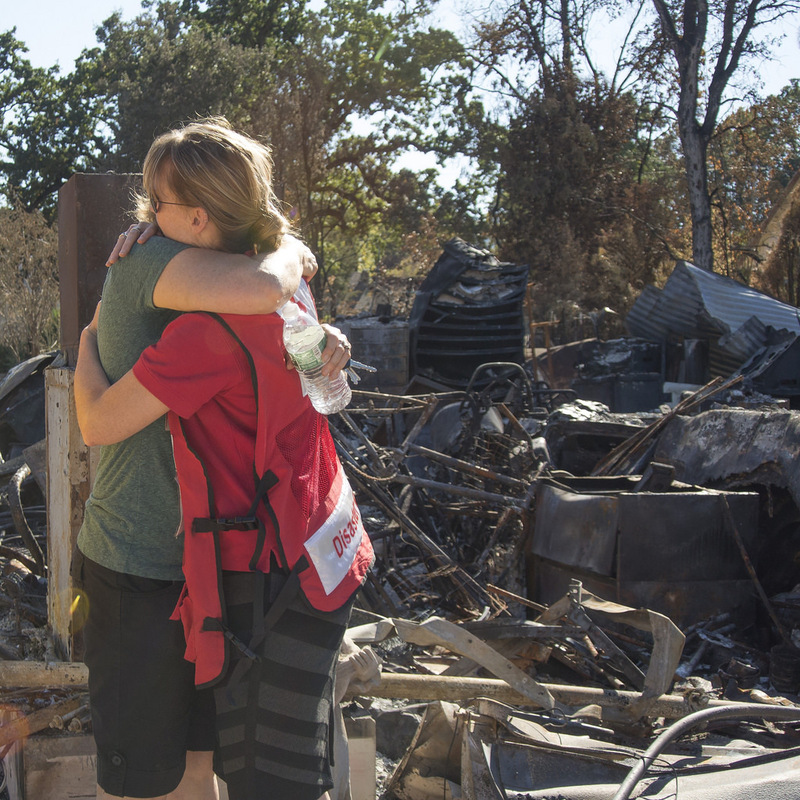 The Red Cross is one of many agencies coming together to ensure that basic needs are met, to work on the long-term recovery of entire communities and to help them be prepared for and become more resilient in future wildfires. 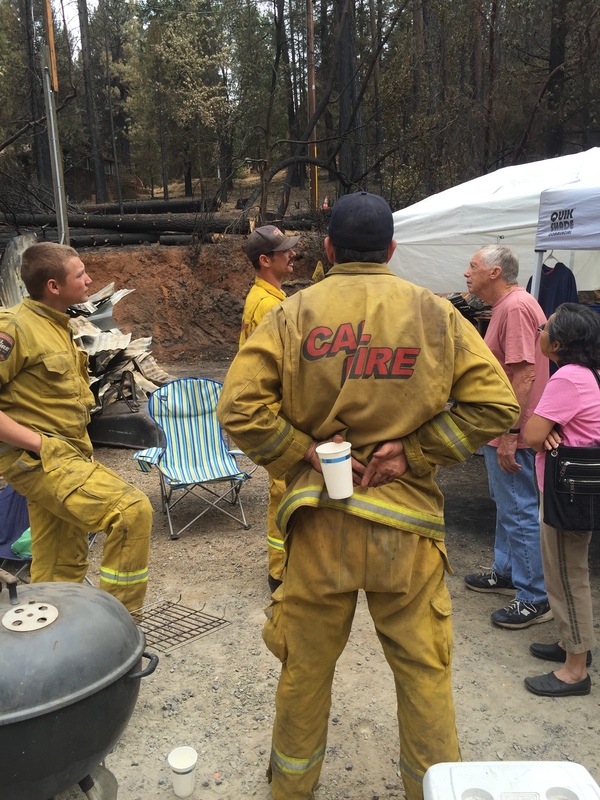 There is a self-sufficient resiliency woven into the close knit culture of the people of Calaveras and Amador County. The Butte Wildfire burned hundreds of them out of their homes. Locals say that they have not seen a fire of this magnitude since 1937. Some of these families have been here for generations and tend to have a deep distrust of government; they prefer to keep to themselves tucked deep into the hills. As a result many are camping on their burned out property accepting help only from trusted friends, family and neighbors. For the Red Cross this means that we have to seek out these pockets of need to offer whatever assistance we can. We also have to build rapport and trust quickly as many mistakenly associate the Red Cross with government. Today, one of the many assignments of the integrated care team was to go find a gentleman named Jerry who was camping out where his home used to be. It took about an hour to finally arrive at his camp. Integrated care teams include disaster assessment case workers and health practioners. When we came upon Jerry, he had heard from neighbors that the Red Cross was out and about trying to help people, so he was upbeat and cheerful as he welcomed us into his camp. He was engaged in spirited conversation with a group of young firefighters who had made it part of their daily routine to check up on him. 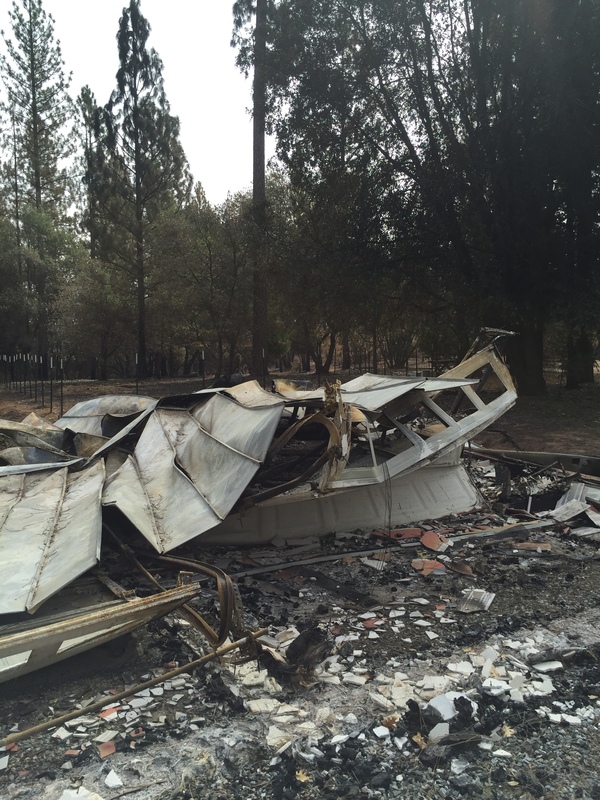 (There are still many Cal Fire teams roaming the area seeking out lingering hot spots.) A visit with Jerry was always a welcome retreat from the rigors of their job. He came to expect them and always made plenty of extra coffee. He offered us some as well as he redirected his attention to our team. After some initial hesitation he agreed to let us sit down and inventory his needs. It was quickly determined that Jerry was on several prescription medications. Our nurse took him aside and began going through his entire shoebox full of medications one at a time and discovered that he needed a couple of refills. He was also running low on hearing aid batteries. Jerry was a Viet Nam veteran and eligible for assistance with his medications, but camped in remote isolation he had no idea that the VA was set up in nearby San Andreas to take care of cases just like Jerrys. Because he is unwilling to leave his property due to looters, the Red Cross offered to advocate on his behalf and get his medications refilled. After the nurse took his blood pressure he rejoined the young firefighters clearly appreciative of the company. There are countless stories just like Jerry’s requiring strategic “search and rescue missions” by Red Cross integrated care teams. —for Jerry it was just what the doctor ordered. 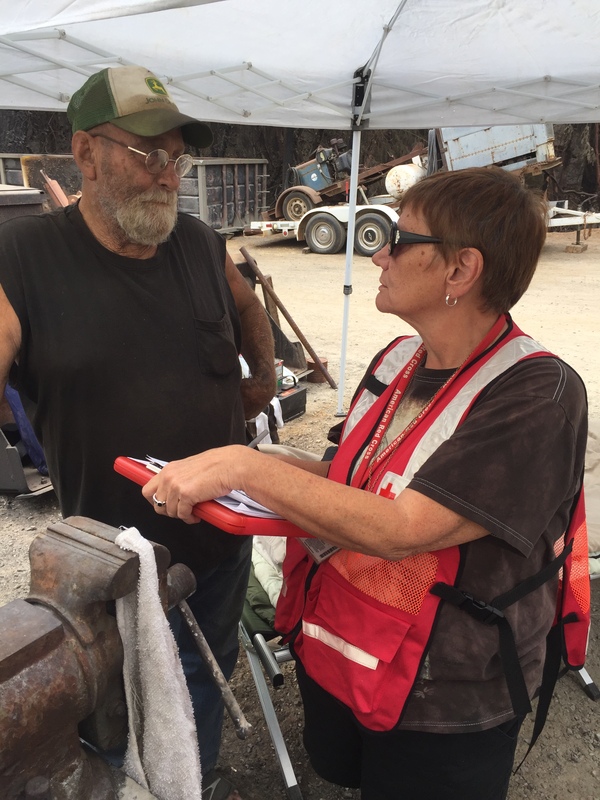 Damage assessment and integrated care teams have been on the ground in both Amador and Calaveras, assessing properties and looking for people who might not have had a chance to visit the Local Assistance Center due to transportation or other issues. 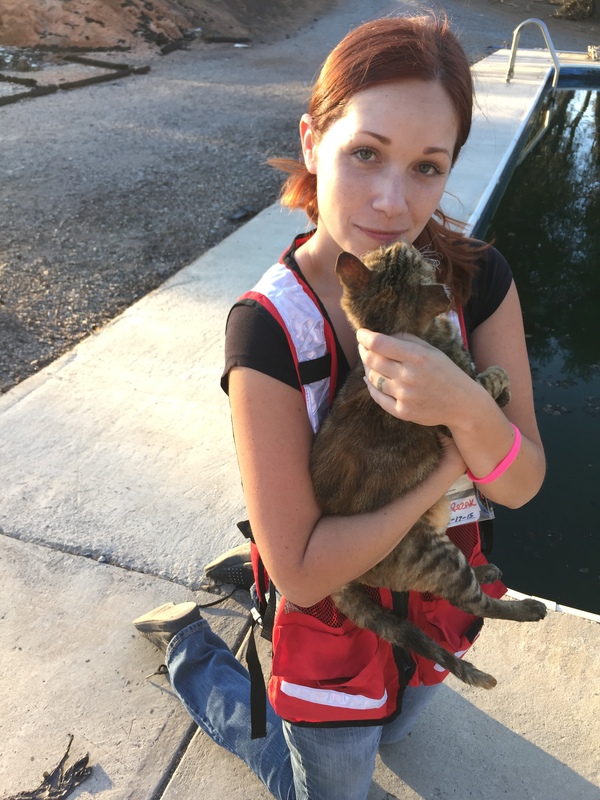 Our teams focus on helping people, but we also care for others… like cats! 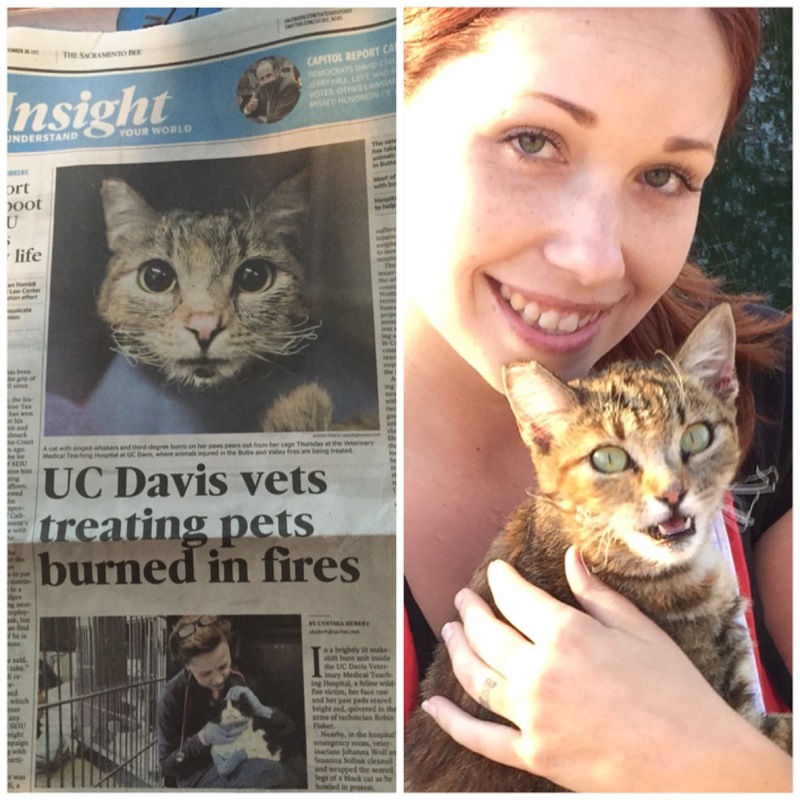 One of our team members found this kitten who was taken to the appropriate agency and a few days later was on the front cover of a newspaper! We want to take this opportunity to give a shoutout to Allison Reezak and Mike Jaime for saving this little kitten’s life. There have been several misunderstandings about the Red Cross and our response to the California wildfires, and we believe it is important to state the facts as clearly as possible. 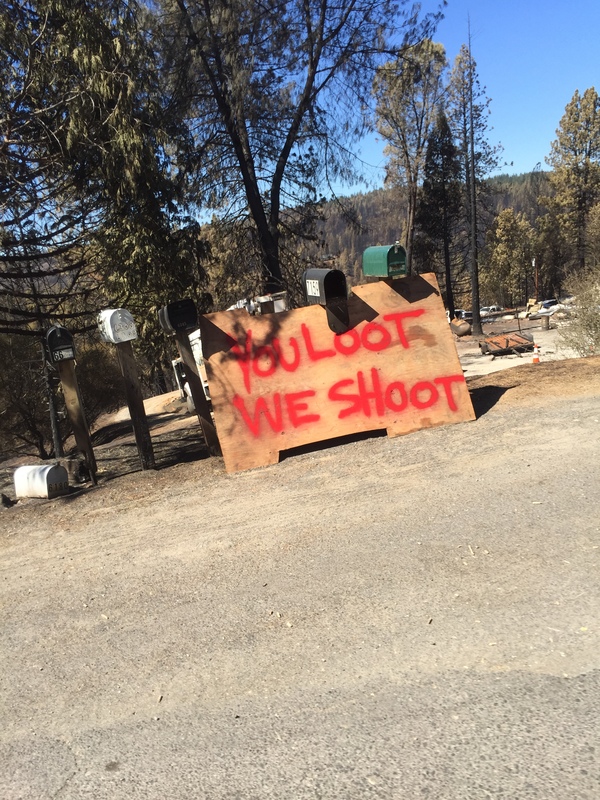 Like you, these are our communities and we care deeply about the people driven from their homes by these terrible fires, especially those who have lost everything. Our mission is simple: to provide shelter, food, and relief to people in need. A disaster this size takes the involvement of many people from many backgrounds and we’re proud to be one of those “helpers”. We are committed to partnering with others with the same or similar mission so that together we can provide a wide range of opportunities for anyone who wants to help fire survivors. Fact #1: The role of the Red Cross is to provide shelter and to support the immediate needs of those affected by the California wildfires, including a safe place to stay, food, water, and health services, cleaning supplies, emotional support and other support resources. We have supported people with disabilities and we also partnered with several organizations to care for evacuated pets and animals. Residents affected by the fires are welcome to stop by our shelters for services during the day even if they choose to spend the night elsewhere. Some individuals and families chose to stay outside of the shelters because they wished privacy that a shelter setting could not provide. Fact #2: Red Cross normally coordinates the handling of in-kind donations with a partner organization that has the expertise in the logistics of sorting and packing goods. We appreciate the generosity of those who have brought items to help others, but we cannot accept in-kind goods donations as we do not have the infrastructure to support management, sorting, and distribution of such items. In Calistoga, Napa County identified the Center for Volunteer & Nonprofit Leadership (cvnl.org) Emergency Volunteer Center to coordinate such donations. 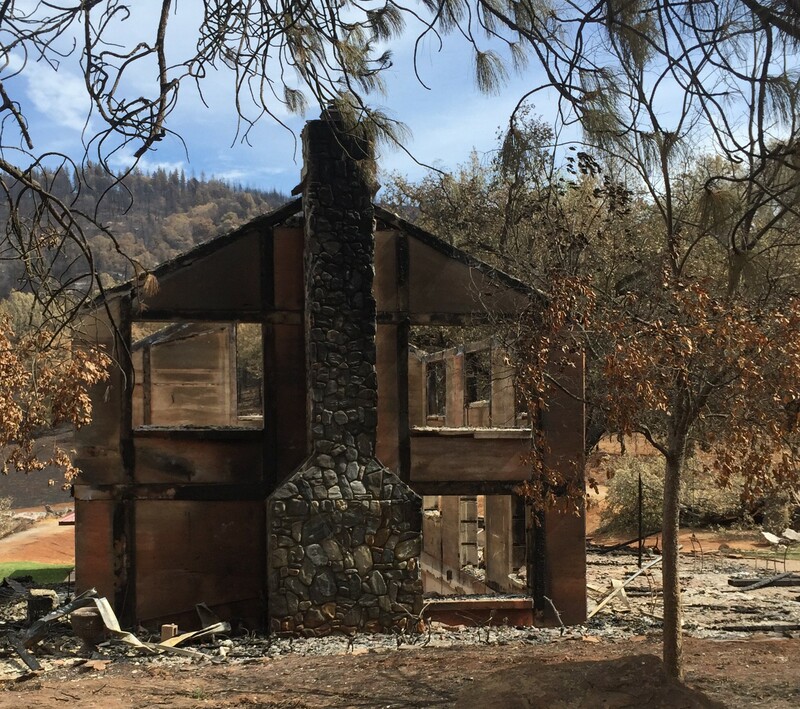 In Calaveras County, if you want do make a donation, contact the Mountain Ranch Resource Center that keeps a list of items needed. Fact #3: Financial donations to the Red Cross are being used to provide help to people in need right now and will enable us to continue providing help as communities recover. As of Sept. 27, the Red Cross estimates that we will spend more than $6.6 million helping people affected by wildfires across the western United States – the vast majority of these costs are for California (more than $5 million) and Washington State (more than $1.1 million).The $6.6 million cost estimate includes wildfire response and recovery efforts in Alaska, Arizona, California, Idaho, Montana, Oregon and Washington State. The Red Cross meticulously honors donor intent. Donations made in support of a specific disaster will be used for that disaster only. Any designated funds we raise beyond what is needed for emergency relief will be put to use serving the recovery needs of the affected communities. Fact #4: An average of 91 cents of every dollar the Red Cross spends goes to our humanitarian services and programs and are used to provide food, shelter, emotional support and other assistance, as well as the staff, goods, vehicles and warehouses that make that relief possible. This means that roughly 9 cents of every dollar donated supports general operations to keep the Red Cross running, such as information technology, fundraising, finance, HR and communications. The Red Cross has been accredited by the Better Business Bureau (BBB) and has a 3-star rating with Charity Navigator. One of the BBB’s standards for accountability is that a charity should spend at least 65 percent of total expenses on program activities. The Red Cross vastly outperforms on this measure. We encourage donors to review our rankings with watchdog organizations and view our audited financial reports on redcross.org. Fact #5: We greatly appreciate the number of individuals who stepped up to volunteer for the California wildfire disaster, but as with any volunteer organization, we must follow certain screening protocols, which take time to implement and are difficult to undertake during a disaster. Any community members interested in spontaneous volunteering help may register online with North Coast Opportunities at ncoinc.org. The Red Cross is a nearly all-volunteer workforce, composed of people who want to help their neighbors. In response to massive wildfires in California this month, local Red Cross volunteers from the affected areas and neighboring counties immediately mobilized to help the relief effort. The Red Cross is always seeking committed, qualified volunteers to help our local communities before, during and after disasters. Please direct anyone who is looking for an ongoing or longer-term commitment to Red Cross Sierra Delta Volunteers and they can work with their local volunteer manager to complete the steps needed to become a Red Cross volunteer. By their very nature, disasters are unpredictable and require immediate crisis management and triage to employ the best possible response and outcome. The reality is that disaster response sometimes is not perfectly executed. We regret that anyone whose offer to help, donate and/or otherwise support support were met with anything less than a compassionate and gracious response from the Red Cross, and we appreciate those who sought us out to express their concerns. 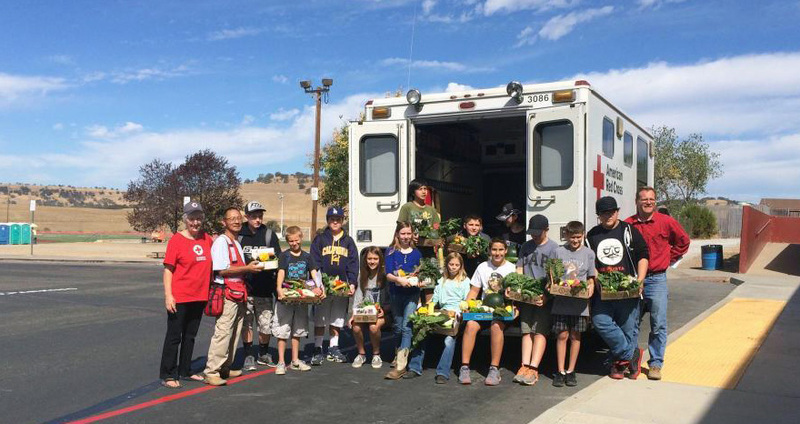 Students from Toyon Middle School in Valley Springs donated their harvest to fire victims. So many people and organizations have stepped up these last two in weeks as the Butte Fire burned more than 70,000 acres in Calaveras and Amador Counties, destroying over 500 homes and evacuating thousands from their homes for days on end. “We wanted to help too,” said Zach Guillemin a Railroad Flat Resident and 8th grader at Toyon Middle school in the garden and landscaping class. “I know a lot of families up where we live that lost their gardens in the fire, and we thought maybe we could give them some of the vegetables we are growing in our school garden since they aren’t able to grow them anymore,” Guillemin said. With the wheels set in motion, many organizations stepped up to support the effort. The American Red Cross, The Resource Connection Food Bank, The UCCE Central Sierra, Calaveras Unified School District, Gardens to Grow In, Community Emergency Response Teams, FoodCorps, Calaveras FFA and many community partners all jumped on board to help make this happen. For the last two weeks all of the vegetables that are being harvested from the Calaveras High School Farm, Toyon Middle School and many of the elementary school gardens have been given directly to those affected by the fire. In addition to harvesting the vegetables and getting them distributed to families in need, Hill also helped lead a cooking session in the Valley Springs Elementary School Garden for Oakendell students who had been evacuated to the gym, and held a garden activity day for children and families evacuated to the campgrounds with FoodCorps service member Emily Metzger. Food harvested from the gardens has been given to the Resource Connection Food Bank and American Red Cross for distribution and given directly to families at the school sites. “We plan to continue giving away the vegetables we are growing as long as there is a need,” said Guillemin. “It feels good to be able to provide something as foundational as healthy food for those that need it,” he added.